Lock in a great price for Skagen Harbour Hotel – rated 9 by recent guests! Great location. Very good breakfast. Nice breakfast room. Very helpful staff. Danish hygge with authentic Danish breakfast; very friendly staff. The breakfast was very good. The staff was helpful and courteous. Our rooms were on the ground floor facing a busy street and the ship yard which made them noisy and not very private. Everything was clean and in working order. The outside garden seating was very cozy. Parking was tight. Location provided easy access to restaurants and bars, and a short drive to shops and museums. The location was good, and the room and breakfast was good. Everything in place, clean with daily service. Staff helpful and friendly. Fabulous staff who go out of their way to make you welcome and give information about local area. Spacious room with outside private seating area. Good breakfast and parking on site. Very kind people ready to give you help if you need it. Comfort place like you are at home! Excellent room, nice little private terrass. A separate toalett, practical! Skagen Harbour Hotel This rating is a reflection of how the property compares to the industry standard when it comes to price, facilities and services available. It's based on a self-evaluation by the property. Use this rating to help choose your stay! 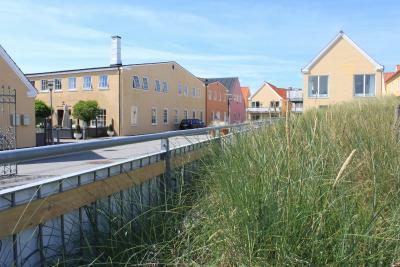 One of our top picks in Skagen.Located by Skagen Harbor, this property provides free WiFi and parking. It offers rooms just 5 minutes’ walk from sandy beaches. Skagen Train Station is 0.6 mi away. Hotel Skibssmedien Skagen’s light, airy accommodations features a refrigerator, flat-screen TV and private bathroom. Guests can sit in the cozy dining room or enjoy Skagen’s famous bright summer nights on the main terrace. There is also a daytime bar. Sct. Laurentii Vej, the main shopping street, is 1,000 feet from Skibssmedien Hotel. The 14th-century Buried Church is an 8-minute drive away. The Swedish Seaman's Church is next to the hotel. This is our guests' favorite part of Skagen, according to independent reviews. This property is also rated for the best value in Skagen! Guests are getting more for their money when compared to other properties in this city. When would you like to stay at Skagen Harbour Hotel? Includes a flat-screen satellite TV, fridge and electric kettle. Spacious suite with fully equipped kitchen, private terrace and flat-screen TV with cable channels. A dishwasher, washing machine and tumble dryer provide further convenience. Features a private balcony or terrace, as well as a flat-screen satellite TV, fridge and electric kettle. Spacious 2-bedroom suite that features a fully equipped kitchen, dishwasher, private terrace and flat-screen TV with cable channels. This family room has a electric kettle, seating area and flat-screen TV. This family room features a balcony, seating area and electric kettle. This suite features a tumble dryer, sofa and flat-screen TV. House Rules Skagen Harbour Hotel takes special requests – add in the next step! Skagen Harbour Hotel accepts these cards and reserves the right to temporarily hold an amount prior to arrival. Guests arriving later than 16:00 are kindly requested to contact the reception prior to arrival, to receive instructions on how to check in after closing time. The reception closed at 16:00: That's too early, and there was no option to buy anything from the bar (because of closed hotel reception). It was not possible to charge the car. In 2019 that shall be possible! In the ground room it was noisy on Friday night with some very inconsiderate guests Until 3am and then again in the morning. There is no such thing that we did not like. Would have been just a little better breakfast with bacon and eggs. It was a bit of a walk to things, but that was part of the charm. The staff were attentive and lovely and the hotel had everything you could want, in a convenient location. The first night was completely silent. The second night the township had a huge influx of tourists. I could hear my neighbour snoring ... had nothing to do with the hotel, but I would recommend packing earplugs during busy periods. The staff were delightful and helped us whenever we needed anything. Breakfast was superb. Rooms were sparkling clean and comfortable. Loved their library and afternoon treats. Very friendly persons, that run the hotel. Very close to the port. Very fast WiFi.